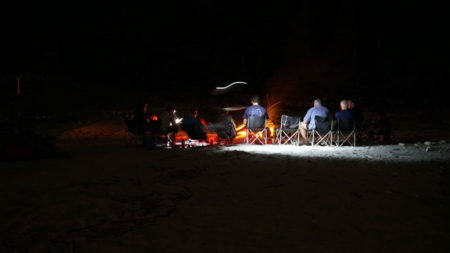 One of the most appealing aspects to a multi-day rafting vacation is we get to stay at stunning and unique campsites each and every night of our adventure. But what makes the perfect campsite? A base for a gorgeous hike? A stunning view? Perfect sand? I ideal place for the loo? Here are a few of our favorite places where we can spend the night. Upper Moemba Camp, Zambezi River: The ‘ride’ into this campsite is un-rivalled, with a run through the incredible Upper Moemba rapid before paddling over to your home away from home. 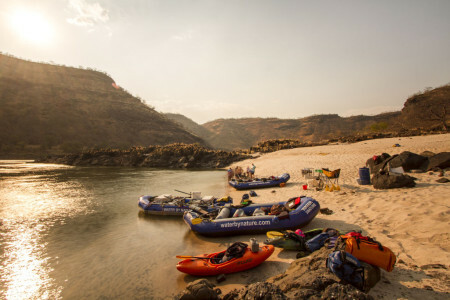 On a river with so many amazing campsites, this can be a difficult choice for us, but with its sprawling dual level sand and two ‘honeymoon’ beaches it sure does take a lot of beating on the Zambezi. Add to that, a short hike over the rocks and you arrive at Moemba Falls, a Grade VI rapid where we kick back, relax and enjoy hors d’ouvres of wine and cheese overlooking the falls. The best bit? The only way in here is by river. Welcome to paradise. Who needs any distractions from this stunning place. 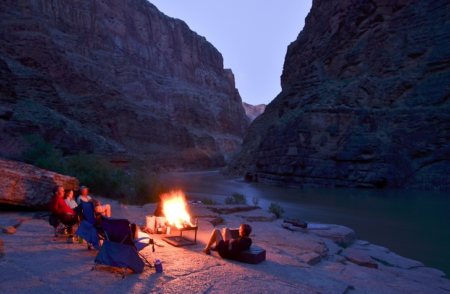 Ledges Campsite, Grand Canyon: Lets face it, as much as we love sand, it gets in everything! One of our favorite places to camp on the Grand Canyon (and lets face it there are plenty given the 13 days on the river) is Ledges Camp at mile 152. The camp has an incredible view both up and down the river and from its elevated position, you will get an amazing perspective on the river. Large flat ledges that are mainly sand free offer an amazing opportunity to view some incredible stars. In the morning when you leave, you are just upstream from Havasu, one of the most spectacular places to hike on the Colorado. Scorpion Beach, Karnali River: Despite, the slightly off putting name, Scorpion Beach is a classic remote river campsite. Nepal is well know for its vast and amazing campsites especially post monsoon when they have been replenished with driftwood after the monsoon. Scorpion Beach is ideally located in amongst a series of wonderful rapids on the Karnali River. Having conquered the sizeable Jungleghat rapid, a short float downstream brings us to our home for the next two nights. Given the perfect huge beach, large eddy (still water) by the beach, make it perfect for a layover day, where we get to rest, read our book, play volleyball or learn to kayak. Tomorrow we enter the Karnali gorge and it’s fabulous whitewater. 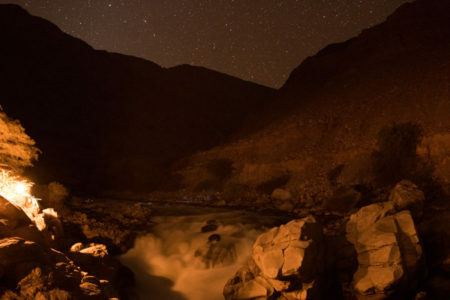 Hyside For Your Life, Cotahuasi River, Peru: On this river that is a whitewater extravaganza, near the end of the trip is a stunning campsite overlooking one of the last big rapids of the trip, ‘Hyside For Your Life’. We set up our dining area on large flat ledges overlooking this spectacular rapid. We also have the opportunity to explore this fabulous area with it’s Inca ruins and terraces. Again being in a very untouched part of the world allows for some pretty pristine archeological ruins including in this case, Mummies. After a great night sleep listening to the roar of the Cotahuasi river, you’ll get to test your paddling skills with our run through the rapid first thing in the morning. Gopa Pokhari, Tamur River, Nepal: Not exactly a campsite on the river, but there are very few places where you might get such a spectacular view as when your guides deliver hot drinks to your tents when you are camping on your way into the Tamur River. 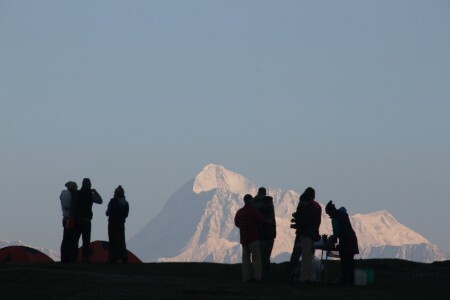 As you approach camp you’ll be treated to some lovely views of Makalu and Kanchenjunga but nothing will quite prepare you for the stunning views you’ll get in the morning. For many guests this 4 day hike to the Tamur River is what makes this adventure so special. However, once you get to Dobhan where we start the rafting, standby for some serious fun. 140 rapids in 120 kilometres. With so many awesome places around the world to stay on rafting trips, its actually very hard to narrow this down to just 5 campsites. No matter where you choose to travel to, the places you spend each night will have been well researched by the guides to give you a wonderful night’s rest in a stunning location.